In this article we discuss a range of business ethics examples deriving from our work assessing companies on their corporate governance performance – examples both of poor ethical behaviour and of sound principles to follow in applying business ethics in your organisation. We also reveal what we believe to be the only effective way of ensuring high ethical standards and so avoiding business failure and improving performance. If you are new to business ethics and corporate governance implementation you may be interested in our Corporate Governance eManual (first instalment free if you register with the site). We also define business ethics here. 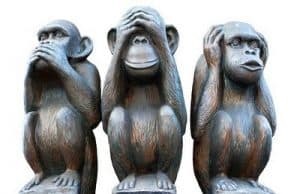 Were the three monkeys right? Perhaps in an ideal world, but we should surely be all eyes and ears to behaviour and report bad business ethics examples. It seems that no matter how many corporate failures, scandals and clearly questionable schemes and behaviour that endanger a company and its stakeholders, there will be people and organisations that think that they can behave in an unethical way – or simply continue without questioning how things are done – without consequences. Even when they are aware of breaches in good ethical practice, somehow ignoring it or worse, hiding it, is the only way to ensure survival. While on a career level it may be possible to sustain this for a time (take the example of Bernie Madoff – see below), there are always consequences and for any organisation to survive long term high standards of personal morals and professional ethics are needed. Indeed many consumers are very disillusioned with traditional business and are increasingly choosing ethical companies as the only acceptable choice. Almost all the major Western banks have been fined very large sums for ethically wrong behaviour including selling unsuitable products to customers, allowing money-laundering on a large scale and rigging interest rates and foreign exchange rates. Pharmaceutical giant GlaxoSmithKline has been accused of corrupt practices in distributing its products in China. Yum Brands (owner of KFC) has been accused of using suppliers in China which have unsatisfactory hygiene standards. Bumi, the Indonesian coal mining business now called Asia Resource Minerals, notoriously wrong-footed Nat Rothschild who thought he could impose western standards of behaviour on his other directors from the Bakrie Group. Foxconn, a Taiwanese technology company employing over a million people in China was hit by a spate of suicides and has been accused of unsatisfactory labour practices. In the defence sector, BAE Systems admitted guilt regarding corruption allegations but investigations continued afterwards. There are many more such business ethics examples on the site, along with many case studies. In some high-profile cases (and probably very many more unknown to the public) a whistleblower has tried to alert the board to ethical malpractice. Well-known examples are Enron, where Sherron Watkins, a senior finance executive, tried unsuccessfully to get Ken Lay, the CEO, to address her concerns about the irregular nature of the financial engineering which ultimately caused its collapse; Olympus, where the newly appointed CEO, Michael Woodford, discovered that major losses had apparently been concealed from shareholders and confronted the board, only to be fired – Olympus is currently being sued for $273million; and recently GlaxoSmithKline, where an anonymous whistle-blower reported corrupt sales practices – the subsequent investigation by the board blew up in their faces when the investigator was arrested and GlaxoSmithKline was itself accused of corrupt practices by the authorities. Whistleblowers are currently quite widely protected by legislation (for example SEC 922 of the Dodd Frank act in the US), but such people usually require a lot of courage as it is invariably career-damaging and in some cases fatal. In many cases, there is a general knowledge in the marketplace in which an industry operates about the actual or likely ethical behaviour of the major players. For instance in the notorious case of Bernie Madoff, whose investment securities business turned out to be a Ponzi scheme with a deficiency of client funds amounting to $65billion, there were numbers of financial advisers who wouldn’t touch him because his operating performance was seen as “too good to be true”. Another example is Eurasian Natural Resources Corporation, which was listed on the London Stock Exchange in 2007, a mining group put together by three wealthy businessmen from Kazakhstan and taken private six years later. The comment from one of its major shareholders was that ENRC was a company that should never have been listed in the first place – the company’s overall corporate governance and small free float should have set off alarm bells. So why didn’t the investors listen to the word in the marketplace? Did greed or personal incentives cause them to turn a deaf ear? And what about the boards whose whistle-blowers alerted them to major malpractices? At Enron it seems that Ken Lay was becoming increasingly divorced from reality as the company he created was becoming a house of cards that would eventually collapse. In the case of Olympus, the board appears to have thought that, like Enron, it could continue to conceal losses indefinitely through the processes it had set up for this purpose and that by firing the person who was inconveniently set on making it public they could restore secrecy and calm. Clearly a board need to keep its ears and minds open to what may be going on, but there seems to be a widespread difficulty of process here which has led to the above examples. In our view, this demonstrates a need to formalise the gathering of opinion about the organisation’s ethical behaviour. Good Corporate Governance requires that the board keeps its lines open to its major stakeholders and our Golden Rules require both an ethical approach to business and accountability to the stakeholders. Our hope and desire is that more organisations adopt this approach and so the business ethics examples we draw to the attention of our many readers will be increasingly of good practice leading to success. The practical way we have devised is to survey the major stakeholders regularly to gain their views about how the organisation is performing in regard to our Five Golden Rules of Good Corporate Governance. 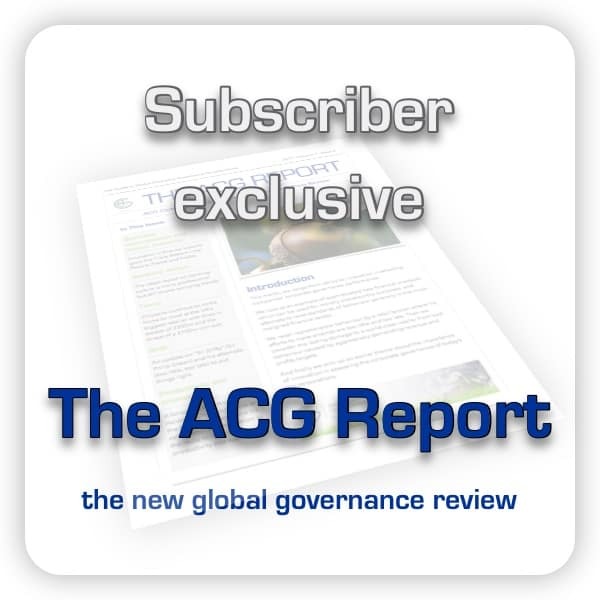 The details of our approach are set out in Volume 6 of our Manual on Good Corporate Governance. Many years ago, we began conducting stakeholder surveys. Back in 1998, our first major project, involving a £1.5bn UK business, very few organisations were doing so and there was therefore a lot of conceptual work required in designing the processes and the questionnaires used. One of the hardest points to conceptualise in a way ordinary people could understand was ethics. We therefore spent a lot of time defining business ethics and creating “proxies” for areas which respondents had little direct knowledge of the company’s policies and practices – business ethics examples, if you will, which could be understood and an opinion offered. For example, if most staff seem happy – or unhappy – in their jobs, it is often an indication of the attitude of managers and of general employee relations. If nothing else, this example is a valuable insight into staff morale, a key measure in creating a positive environment and one of our sound ethical principles we will now list. This is clearly a very different approach to the usual box-ticking approach where a third party assesses your company against relevant regulations, codes of practice and industry standards. While compliance is clearly important, and there are also some good ethical certification programmes around, in our experience it is certainly no guarantee of good ethical behaviour. Your own research, both in the many case studies on this website and elsewhere on the web, will confirm this. We strongly believe that our primary research approach – talking directly to people involved in and affected by an organisation. This clearly requires strong buy-in and leadership by the CEO and the board and a commitment to ensuring the whole organisation is open and honest. As we mention elsewhere in the site, and as we have just implied, we believe that business ethics is about not only subscribing to the principles of responsible business but having effective controls on how stakeholders perceive your performance against a range of issues which constitute ethics. So this our first principle, which requires open and two-way communication with stakeholders to find out, first hand, how others perceive you and for you not to rely on purely your own instinct and knowledge. As we have also just mentioned, one of the best business ethics examples is how motivated and content employees are. Many of our Golden Rules of corporate governance can affect this, from having a clear goal that staff are aware of and agree with, to being truly transparent and accountable and ensuring fluid, two-way communication. Morale is about so much more than financial benefits, as countless polls and surveys have revealed. It is fundamentally about good, conscious leadership, which draws people to you rather than imposing your will on them. By being truly open and aware of the needs of others you are in a much better position to satisfy not only your customers’ needs, but also your employees and other stakeholders. See our Leadership Zone for more on leadership, including a specific section on Conscious Leadership. Being conscious of your employees is one way of creating sustainable growth through loyalty and passion generated in your people. Clearly other business ethics examples also contribute and these include a commitment to environmental sustainability, which, aside from benefitting the planet as a whole and future generations, can also have significant cost benefits in the long term. Thinking long term, rather than for short-term gains (a major contributing factor to the financial crisis of 2007-8) is, for us, fundamental to a sound ethical base. Only by considering the longer and wider consequences of the activity of your organisation can you truly behave in a way which will create a positive impact in the world and help ensure financial sustainability. You will note that we have not included in our sound business ethics examples the usual buzzwords – words like honesty, integrity and morals. This is because we feel they should not need spelling out. It should be very clear that to behave ethically is to tell the truth and try to do the best you can to “be good”! This is a heavyweight website (but written in plain English, not jargon or management speak) whose mission is to change the way business, non-profit organisations and indeed governments act for the benefit of everyone and the planet – the so-called Triple Bottom Line: People, Planet, Profit. It would therefore be an insult to your intelligence and inappropriate to make bland statements essentially attempting to define right and wrong on a basically human moral level. We leave it to more philosophically- and theologically-orientated sites to do that! Our role is to highlight issues affecting business and society, including business ethics examples, and to provide knowledge and practical solutions to address them. Part of this role is to offer help and feedback on your questions, so please get in touch via our contact form. Or share your own examples of good and bad business ethics below using our content invitation form. Click here for more business ethics examples to assess corporate governance or have a look at some of the posts in our ethics category below.